Mandeep Bedi (A.B. ’10), who wrote his senior honors thesis on American graffiti and taught Chicago high school students about the politics of soccer and contemporary freedom of speech, died from his injuries last month just days after being struck by a car. He was 23. Bedi, who graduated with a degree in anthropology, worked in the IT Services and Solution Center, where he was known for always offering a warm cup of coffee to new customers. For those who knew him in May house in Max Palevsky, he was known to be unrelenting in his loyalty for the English soccer team Arsenal. But on August 19, Bedi and his wife Elizabeth, a fourth-year in the college, were driving down East Garfield Boulevard in Washington Park when an altercation broke out with another driver. Bedi and his wife were struck by the other vehicle and taken to John H. Stroger, Jr. Hospital, the Chicago Sun-Times reported. Elizabeth was treated for minor injuries, and Bedi died six days later. The incident is currently being investigated as a homicide by the Chicago Police Department. Students were notified of Bedi’s death in a college-wide e-mail from Dean of Students Susan Art on August 30. “He will be sorely missed,” Art wrote in the e-mail. On September 1, friends and family joined Elizabeth to remember her husband’s life. A temporary graffiti wall was erected on Bartlett Quad, where participants drew symbols in remembrance of Bedi’s love for the art form. 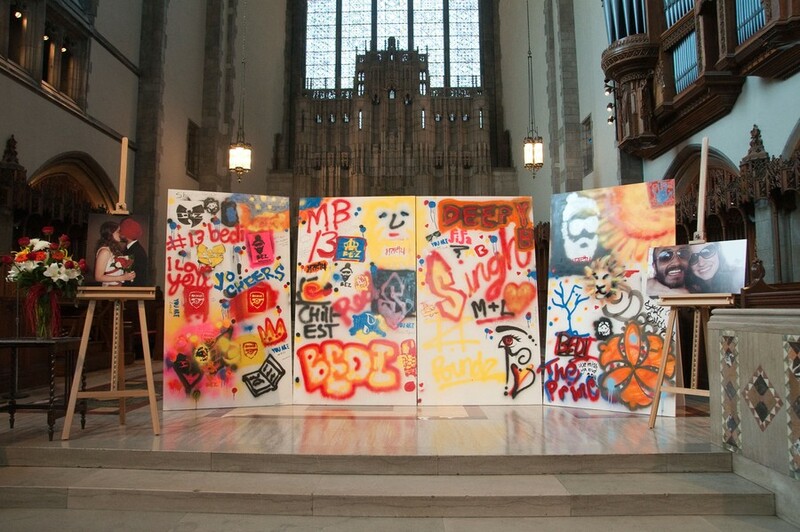 The wall was then put on display and surrounded by photos of the Bedis in Rockefeller Chapel, where some of Bedi’s favorite artists blasted from his iPod. Elizabeth delivered a eulogy for her husband, sharing her first memories of him. Matthias Dean-Carpentier (S.B.’10), who was the best man at Bedi’s wedding, told the audience that Bedi could talk his way out of any situation, including an incident when someone reported Mandeep walking around in his trademark black puffy coat in 80 degree weather. “Mandeep had a way with words. He never said anything simply, but by the end of it you had his thesis and more points of evidence than you’d need,” Dean-Carpenter said. Professor John Kelly, one of Bedi’s most influential professors, was unable to attend the ceremony, but submitted a statement praising Bedi’s intellectual curiosity. “Mandeep reveled in thinking along with other students rather than trying to distinguish himself from everyone else. He had the kind of intelligence that was there to help others,” Kelly said in a statement that was read by Russell Tuttle, Director of the Anthropology Department. After the memorial service, Elizabeth Bedi led participants, all dressed in bright colors that denote mourning in Bedi’s Sikh tradition, on a walk to Promotory Point. During the memorial service, Elizabeth Bedi remembered the happiness that seemed to radiate from her husband.